Dimensions and Weight 22″ W, 21 1/2″ H, 10 5/8″ D; 42 lbs. Starting with a to-spec replica of the paper wound, model 1848 output transformer by Triad Magnetics (the manufacturer of the original transformers of the tweed era), Dr. Z made an exacting recreation of the Bandmaster and sent it off to Joe, who was ecstatic with the resulting amp. Later in the year, after Joe requested some tweaks and alternations, Dr. Z completed the first prototype of what would become Joe’s signature amp: the Z-Master. Though rooted in the ’59 Bandmaster, Dr. Z and Joe designed the Z-Master to suit his playing style and his vast, unique collection of guitars, resulting in what he would authentically deem his “signature amp.” These particular adaptations include the independently voiced “Vol. 1” and “Vol. 2” controls that are internally blended, as to achieve a tonal balance to suit the specific nuance of both the player and their guitar of choice. On Joe’s request, Dr. Z also pumped up the power supply of the amp to welcome the bevy of effects on Joe’s pedal board, creating a sustaining clean tone full of detailed shimmer and percussive punch. The Z-Master is suited for the modern pedal effects player providing ample clean headroom early on the volume controls, or for the guitarist who simply wants to plug in and crank up, just swing the volume dials clockwise to unleash thick, tube overdrive and saturation from the alnico speakers. 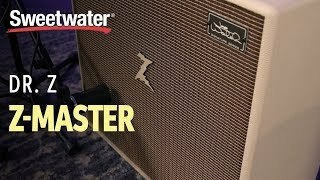 The Z-Master has been road-tested through the 2018 concert calendar serving as Joe’s main amp on stages worldwide. The Z-Master pumps out 30 watts through its unique 3×10 speaker configuration. It uses three, 10” paper voice coil, alnico speakers in a parallel wiring configuration, specifically designed for this amp. This creates an intentional impedance mismatch between the speakers and output transformer, which is an integral part of the sonic recipe of the amp. 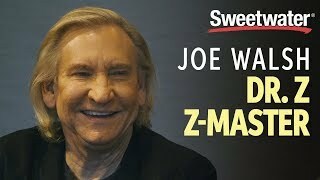 As the first “signature series” amp in Dr. Z history, the Z-Master exhibits a wholly uncanny voice not unlike the man himself, Joe Walsh.